This article is part of a series exploring the stores that led to the grocery chain Tradewell Stores and its history through the resignation of Monte L. Bean. Tradewell was christened in October 1939, based in Seattle, and spread stores down the West Coast. But it was a direct descendant of at least four other Seattle-based chains and carried the two-decades-old mantle of self-service chain stores in Seattle. This article focuses on Eba’s, a stall in the Pike Place Market that grew into a chain that was the last to join Tradewell’s main predecessor. Herman Adolphus Eba was born in Columbus, Ohio in 1870. His father Isaac was a horse-driven streetcar conductor and his mother Leontine, born in France, was a piano teacher. Herman was in business with his brother Edward selling pianos and organs in Columbus until the 1893 financial crash. Then he managed the Brusch Creek coal mine in Columbus, Ohio from at least the early 1890s until 1907 or 1908. Although Herman remained in the Columbus city directory in 1908, he was already in Seattle by mid-year. Herman Eba apparently moved to the shore of Lake Washington along the Rainier Valley in 1907 and opened a stall at the Pike Place Market that year or soon after. According to his 1920 obituary Herman Eba moved to Seattle “thirty years ago” which meant 1890. This must have been a simple transcription error, though, meant to be “thirteen years ago.” His first mention in the Seattle Times came in 1908, a classified ad that listed his address as Montera, Washington. Montera was a small farming community in the current Rainier Beach neighborhood of Seattle. His obituary as well as 1927 advertising indicated that Herman Eba was one of the first tenants of the Pike Place Market’s Main Arcade, which opened in November 1907. In 1910 Eba ran a classified in the Seattle Times and gave contact info at a stall in the Pike Place Market, confirming an early date. Herman and his wife Minnie’s son Earl Eba began working at the store at a young age. In May 1917 Earl was drafted for Army service in World War One. Unlike Alvin Monson’s traumatic experience though, Earl never saw combat. He entered as a Quarter Master Corps sergeant chauffeur in the 217th Motor Truck Company, then the 335th Motor Truck Company and finally he was stationed at Camp Wheeler in Georgia as part of Company B, 106th Supply Chain, 31st Infantry Division. The 31st stayed in Georgia until October 1918, four months after Alvin Monson’s machine gun company and almost a year after Frank Jeffrey’s National Guard artillery unit were deployed. The 31st arrived in France in time to hear stories of the German army in tatters. Within a few weeks Armistice was signed and the war was over. Earl was discharged in June 1919 and returned to Seattle, helping his father Herman manage the two Eba Grocery locations at the Pike Place Market. Herman needed the help as he had fallen into ill health. A year later in August 1920 Herman, distraught by his worsening health, committed suicide. The Eba family had already sold their store at 1525 Pike Place in May 1920, likely tied to Herman’s illness. The buyer was G. F. Hastings, formerly manager of the Public Market Grocery at 1503. Hastings rebranded that store the previous year to Hastings’ Cut Rate Grocery, and he brought the name with him to the store he bought from Eba. In his ads Hastings directed customers to the big pickle barrels outside of his store. In January 1921 George O. Brehm acquired the Public Market Grocery and switched the name to Brehm’s Cut Rate Grocery. Brehm pushed locally made products as a way to help reverse the post-war recession. It was in some ways self-serving, as Brehm owned a wholesale butter and egg distributor. The next year in September 1922, Brehm sold the grocery to Earl Eba, who changed its name to Eba’s Cut Rate Grocery at 1503 Pike Place. Brehm continued selling butter and eggs next door at 1505. Eba was just a few stalls down from his former store and in direct competition with it. In 1922 Eba also opened or acquired the All American Fruit Stand at 1519 Pike Place Arcade, across from Manning’s Cafeteria. In 1926 Eba began building a chain of groceries, maintaining 1503 Pike Place as his main store. First he temporarily opened a store at 224 Pike Street. Then in March 1927 he purchased four independent stores: Malmberg’s Market at the Alaska Junction in West Seattle; Herrett’s at California and Admiral in West Seattle; McRae’s Market at Olive Way and Bellevue on Capitol Hill; and Olympic Grocery on Renton Hill. Growth continued quickly in 1927. In May a store was added on 45th in Wallingford in a newly constructed retail buiding near Meridian. 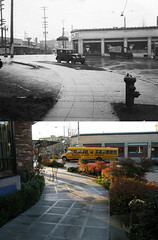 By October stores were added in Roosevelt, Rainier Beach, and the Corner Market Building. Next stores were added in 1929 in Columbia City and the East Union District. The Roosevelt store was owned previously by the Gerring Brothers. The Rainier Beach and Columbia City stores were previously grocery stores belonging to butcher Carl Buse, while the store at 23rd and Union belonged to butcher Frank Casey. The chain held steady as the Great Depression took hold, only closing the Wallingford store in 1931. The next year in 1932 Eba’s Cut Rate Grocery and Markets merged with Mutual Markets to form a large 52 store chain across the region. As discussed in the previous article in the series, Mutual Markets had just been formed the year before from United Groceries, Piggly Wiggly, and Pay’n Save to total 94 stores. 50 of them were lost before the merger with Eba’s. While a few stores were lost and a few new stores opened, the new Eba’s Mutual chain stayed mostly static until 1939. Earl Eba remained in leadership of the chain with Frank Jeffery. Link to ZIPped KML of above map locations. Free to use however you can. I’d love to find out what you did with it. By the end of 1939 Eba’s Mutual owed too much money to too many people. Distributor Pacific Gamble Robinson seized the chain as well as at least two other small chains in Seattle. Faced with the same debt, PGR looked for a way to recover them from bank loans, back rent and other debt. Eventually PGR convinced Portland’s Monte L. Bean to move to Seattle and take over the stores as a subsidiary. Bean was a successful Safeway executive leading the Northwest region who had left to recover from illness. Bean incorporated Tradewell Stores in October, 1939 and set out to right the ship. In Bean’s autobiography These Mortal Years he had nothing positive to say about Earl Eba or the leadership of Eba’s Mutual Markets. Bean described old, out-of-date stock on the shelves and over-invested commodities such as $100,000 worth of sugar to supply the 37-store chain. By liquidating unneeded merchandise he was able to eliminate the chain’s debts in months. In his book Bean described Eba’s indulgence by recounting the bad reputation that Eba had at ball rooms and event spaces. While Bean’s devout Mormon background likely colored his perception of Eba, at least one story in the Seattle Times backs up the idea of a frat boy atmosphere. Each month in 1936 the Eba’s manager with the worst sales would be sent home with a ring-tail monkey to take care of. After nine months of being passed from manager to manager for care and feeding the monkey was finally donated to the Woodland Park Zoo, ending the period of abuse. After pulling Tradewell out of debt, Monte L. Bean grew it into a regional powerhouse that competed head-to-head with Safeway. After exploring some of the Eba’s locations, this series will catch up on Bean’s biography and then launch into everyday modernism and the Burien store that inspired this research.